Again a month has gone by already. The shortest month February of 2017 is already running. 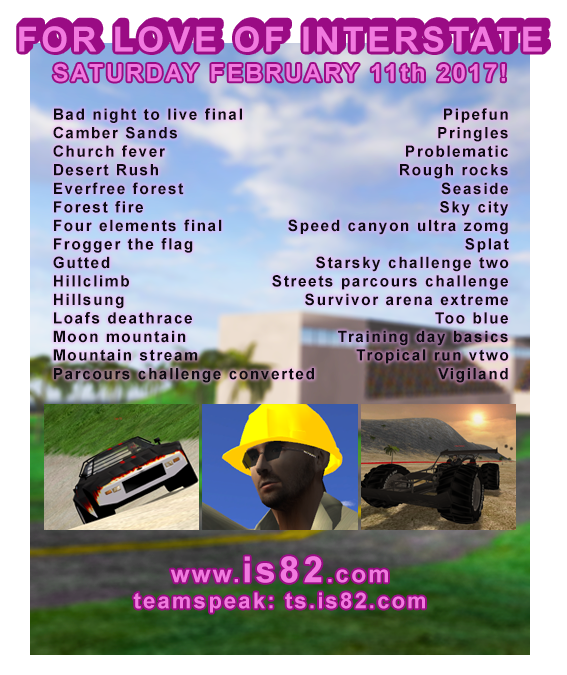 Today is a good day for you because you get an invite from the is82.com Community for the second Interstate 82 event in 2017. At the event the entertainment revolves around the lonely Valentine's Day heart of this world. But all the others are to be invited in. Long speech short. Let's go Saturday, the 11.02.2017 from 00 hours CET. And at the end is when you want it. All what established Battlefield 1942 players or new players which universe would like to learn the game and the mod need can be found at the end of the article to be here. Los geht es Samstag, den 11.02.2017 ab 00 Uhr CET. Und Ende ist wann ihr es wollt. Alles was etablierte Battlefield 1942 Spieler oder neue Spieler die das Spiel und das Mod Universum gerne kennenlernen würden brauchen findet ihr am Ende des Artikels um dabei zu sein.